It's been awhile since I did any type of posting on my nail care routines but this new product from Oil Essentials provided a great chance to introduce you to another way to keep your hands soft and protected! Cuticle oils have been the rage for awhile now, and I was finding myself buying more and more of them but not always using them. Either I wasn't a big fan of the smell or how they applied or how they soaked into the skin. Oil Essentials is a collection of beauty oils that is made with natural and sustainable blends of essential oils and fortified with an advancing anti-aging Luxmeadow E Complex along with powerful yet gentle extracts. They are free from parabens, sulfatez, phthalates and synthetic colors and are safe for most people with sensitive skin. 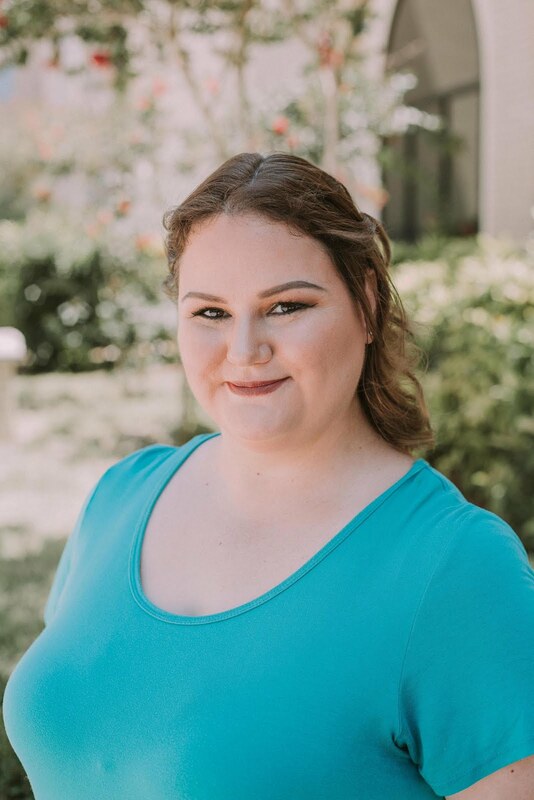 There are currently 6 different oils out there - Seabuckthorn Berry and Borage, Omega 3/6/9 and Evening Primrose, Neroli and Avocado, Argan and Wheat Germ, Sweet Almond and Macadamia and the product I am using, Lavender and Rose Hip. Each oil helps your skin and hair in different ways. 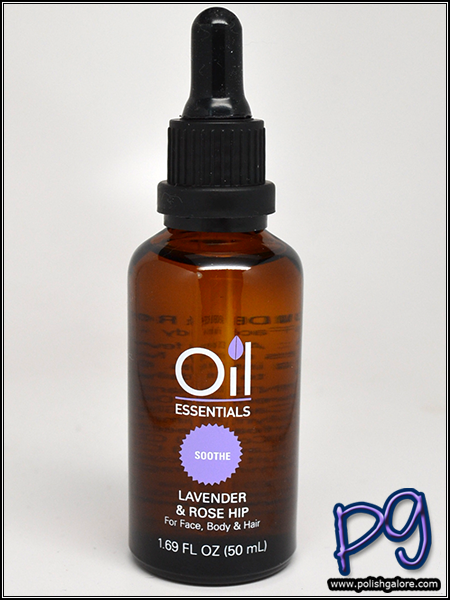 The Lavender and Rose Hip oil is a soothing blend of lavender and rose hip oils, with the added nourishing effects of coconut, sunflower and meadowfoam seed oils. As you can see, the bottle comes with a long eyedropper top or you can just use the oil that collects along the tube of the dropper. On top of being used for my cuticles, you can also add a drop of the oil to your favorite skin or hair-care products but I haven't gone to those lengths yet. I took one drop of the oil and spread it on all my fingers and gently rubbed the oil into my skin. This photo was taken about 5 minutes after the oil was applied and as you can see, my hands are still super moisturized. I have absolutely nothing on my naked nails - not even base coat (and it's RARE that I don't have base coat on - this was after a swatching session). You can see that my hands appear healthy, and very moisturized. About 30 minutes after applying, the oil was completely soaked into my skin. Before that point, anything I touched left an oily residue (like my camera) so be aware of that when applying. I have been using this oil weekly now and I'm happy to say my cuticles are pretty happy with me. The scent is very pleasing to me being a mix of lavender and rose (my two favorites) but isn't so overpowering that I get a headache. Also, you can see that this bottle is large - 50 mL. In comparison, a bottle of China Glaze is only 14 mL. The best part for me is the price and the location to buy. Oil Essentials launched this spring in Rite Aid, Target, H-E-B and Walmart. While I don't have a Rite Aid nearby and the nearest Target is an hour away, I live within minutes from H-E-B and Walmart so I can easily go pick up another bottle when I run out, and I plan to. Then there's the price... Each bottle of Oil Essentials is only $12.99. YAY. Considering I only used one drop per oiling session, it may be awhile before I run out, but it's so great to know that it's nearby and affordable. 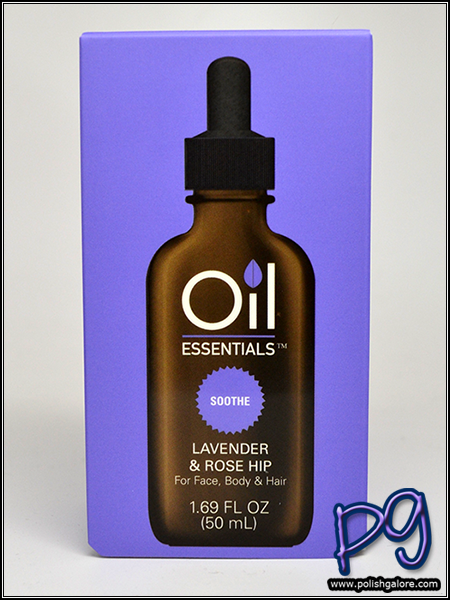 Oil Essentials [website] is available for $12,99 at Rite Aid, Target, H-E-B and Walmart. Join the conversation with them on Facebook, Twitter, Pinterest and Instagram. 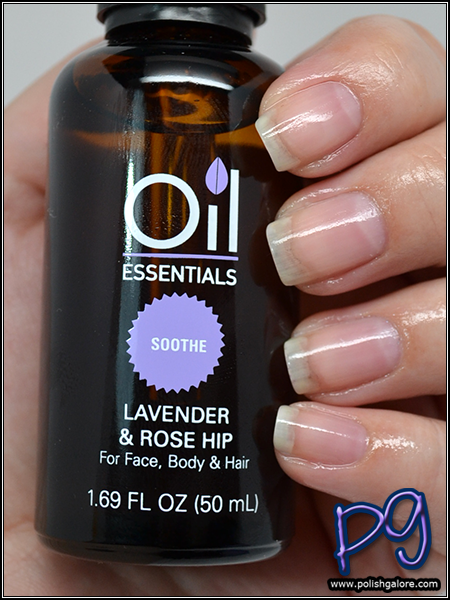 I am a huge oil fanatic, and this one sounds especially soothing and lovely to me since I love lavender and rose hips! THanks for the great review! I am testing a couple of their oils, but this is not among them! I hate lavender, as it can trigger migraines for me. Not a favorite! Your hands looks so nourished! Lavender is my favourite essential oil. Your bare nails look awesome; not a hint of yellowing - how do you do it? Yeah this winter was seriously harsh! I'm not looking forward to our summers either but I am interested to see how this will fair on my skin during the heat too! They have a good amount of them! I can't wait to go buy the avocado one at my HEB. I haven't seen them in my stores yet but I know it's coming! It's SO soothing for me! Eep! Definitely stay away from this one then. While it's not overpowering, I definitely wouldn't want you to even be close to a migraine! SWEET! Yeah I literally live in the middle of an HEB and a WalMart so we go to which ever one has the better deals of the week, lol! Thank you! I wear base coat ALL the time - even if I'm not wearing anything else. I tend to stay away from yellow-green polishes or deep blues as they can stain but IF I get a bit of staining, I clean my nails with soap and a nail brush as soon as I remove the polish and I don't ever wear a manicure more than one week. The biggest one is just wearing base coat - I go between Cult Nails Get It On (now discontinued) and Duri Rejuvacote. This sounds like a great oil- love the reasonable price too! Ohhh this sounds lovely. I'm going to keep an eye out for it! Wow! This sounds so lovely. I need to try it for sure, my cuticles are HATING me right now. Especially for the bottle size! Aww, yeah lavender is one you either love or hate. It should be out now! Yeah this was a really harsh winter!